Part 8 in a series featuring sites I visited in Ireland while researching my second novel, The Prince of Glencurragh. See previous posts listed at the end. Sometimes, though sand and water wash away the past, research and imagination still can resurrect it. From Timoleague, Clonakilty is nearly a straight shot west along the R600. Heading south from there are rolling hills, green bluffs and marshy expanses leading toward Dunnycove Bay. On most driving and tour maps you’ll see a notation for Castlefreke. Built by Randall Oge Barry in the 15th century, the fort was lost to the English after the Battle of Kinsale, was besieged and later burned during the Rebellion of 1641. A tower house was built on the site in 1780, which was remodeled in 1820, burned down in 1910, and at the time of my visit it was being remodeled as an event venue. However we did not visit Castlefreke itself, because it was not my destination. Instead, I wished to see Rathbarry Castle, the Red Strand, and just a little farther west, Coppinger’s Court. 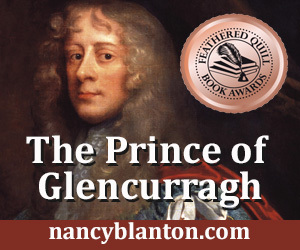 Featuring characters from the Barry family in The Prince of Glencurragh, I sought locations where they might have met or slept. I was to find little remaining of the castle, but enough to stir my imagination, and even more so, the illuminate larger forces that had been in play in the region. Thanks to my friends Eddie and Teresa, who introduced me to their friend Pat Hogan, I was able to visit and learn much about Rathbarry, and it became a landmark in the book, near the cottage of the mysterious healer Pol-Liam. The castle Rathbarry existed on the site of what is now Castlefreke, bearing the family name of Freke for the current owners. Far out on the roadway, the gateposts marking the entrance to the castle grounds with their large spherical tops were said to be true remnants of the 17th century. Just one wall of the ancient stables and carriage house remained, and a new stable house had been built within it remodeled as a private residence. We were treated to a peek inside this structure to get a feel for what home life was like there. From the upper wall of the ruin, crumbling stone stairs led down to an ancient watergate, a stone passage leading directly from the castle to the water, where boats would have come to deliver food and supplies. But, except for a small, enclosed pond, there was no water. From the top of the steps I could see the bay, maybe half a mile distant. How, I wondered, could the castle have been served from such a distance? As Mr. Hogan reminded me, the landscape had changed dramatically since the 17th century, and events at the global level could have affected Ireland’s coastlines. In fact, in 1755 the Great Lisbon Earthquake and tsunami are believed to have done so. Considered one of the deadliest earthquakes in history, it is estimated to have hit the 8.5 to 9.0 range on today’s scale of magnitude, killed thousands of people and nearly devastated Lisbon. The tsunami’s impact was far-reaching. Gigantic waves were reported as well in the West Indies and Brazil. Could these environmental events have shifted sands and reshaped Ireland’s coastline? Undoubtedly. Almost within view of Rathbarry was another site I wished to visit: the Red Strand. Also likely to have been altered by the tsunami, this sandy beach was called “red” because the sand contained fossilized sea creatures or “calcareous matter,” which was believed to have a healing effect and also promote fertility. As late as the 19th century the sand was being collected for use in fertilizing crops some 16 miles away. The only red I saw during my visit was in the clumps of seaweed washed ashore; still, the strand fascinates, bounded on one side by stones, and on the other by bluffs and stream. The strand and the story behind it served my imagination for a deadly scene in the book. Thanks to: Library Ireland, Exploring West Cork by Jack Roberts, Castles.nl, Pat Hogan, Eddie McEoin, Wikipedia and other sources.